Logitech, an industry leader in the computer peripherals market, provides an application called Logitech Control Center (LCC) to support their keyboards and mice under Mac OS X.
LCC internally used Unsanity’s Application Enhancer (APE) which unfortunately is not yet supported within OS X version 10.5 (Leopard). APE was one of the reasons why users weren’t able to straight-forwardly upgrade their Tiger installations to Leopard, ending up with some kind of blue screen once the installation was finished and they wanted to boot into their shiny new OS. Instructions for removing APE (highly recommended before upgrading to Leopard) can be found on the Apple support website. So far, the special keys (“iTouch”, “Search”, “Shopping” etc.) on the Logitech keyboards can’t be used with Leopard. But at least most of the Media Control buttons (skip forward/backward, play/pause and the volume control) actually work and those are almost the only special keys I need on that keyboard. What bothered me was the fact that the key binding for the Windows/Option and the Alt/Apple/Command keys were mixed up: on my MacBook Pro, the order of the keys (from left to right) is Control, Option, Command. 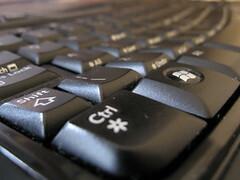 The Logitech keyboard uses the same labels on the keys but with the factory settings of OS X, the Windows key acts as Apple’s Command key and the Alt key is used as the Option key. This is quite strange because you’re always hitting the wrong keys when you’re often switching between “docked” mode (using an external keyboard when you’re working on your desk) and “road warrior” mode when you’re using the MBP’s internal keyboard. Luckily, with Leopard you’re able to change the key bindings within the Keyboard & Mouse preference pane of OS X’s System Preferences individually for each keyboard that is connected to your Mac (see the screenshot below). The Logitech keyboard shows up as “USB Receiver” in the keyboards list. After selecting this from the list, just change the binding of the Option and Command keys to each other’s function and voilà — it’s working. Logitech keyboard picture by bargainmoose, CC-licensed.